Original Japanese title - Furankenshutain no Kaijū Sanda tai Gaira which literally translates as Frankenstein's Monsters: Sanda Against Gaira. 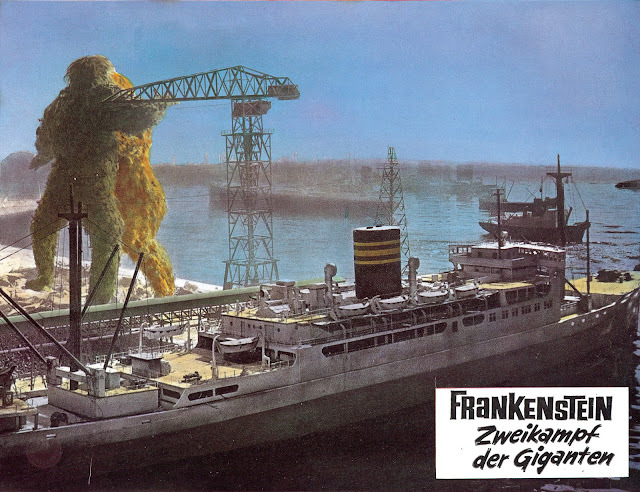 This film has a number of model ships in it including a tug boat that is used as a weapon by one of the monsters. It has a plethora of other miniatures in it as well with a huge array of very effective crumbling buildings and a large assemblage of slightly toy like tanks, jeeps trucks, helicopters and Maser cannons. There are a few shots that are let down by depth of field problems, generally in the shots where the smaller models are used. The expansive miniature landscapes that the monsters caper about in are very well done particularly the rural settings which have extremely good miniature trees and foliage. This was helped by the fact that the monsters are somewhat shorter than the usual Godzilla scaled monsters so the miniature sets could be built to a larger scale. 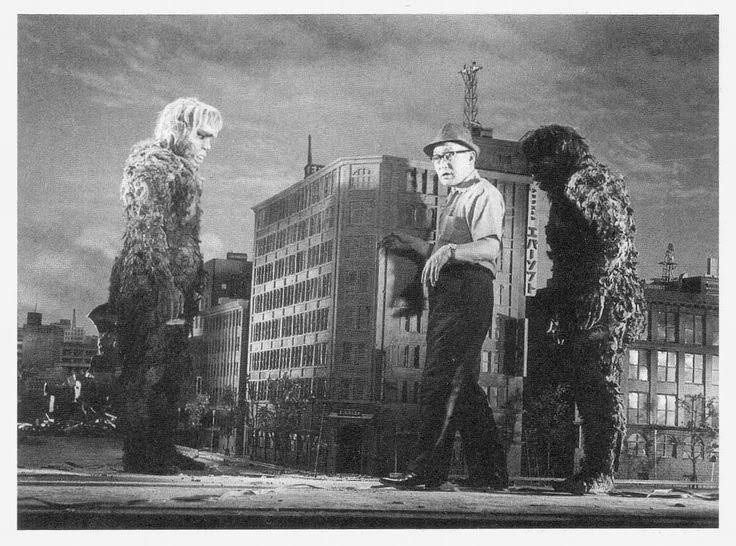 Eiji Tsubaraya and the two "gargantuas"
One of the features of the man in a suit movie is you can directly see how big the miniatures are. 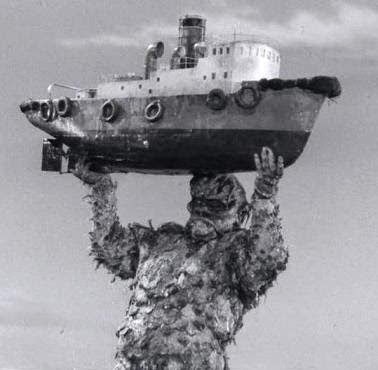 In one scene the green monster picks up a few of the tank models and throws them at houses so you can get an idea of the size as he picks them up in his hand. I estimate the scale to be between 1/16th and 1/10th though it seems to vary from scene to scene. 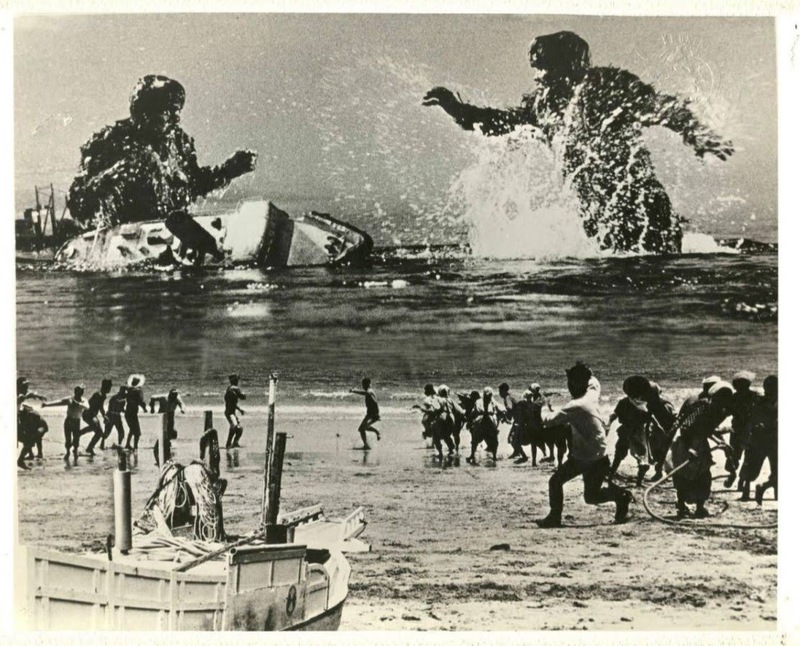 This is a composite still photo, there is no comparable scene in the film. While the design of the monsters is frankly odd (they look like they are made of lumpy papier mache) the conclusion of this movie is even odder, helicopters drop bombs on the fighting critters and then out of nowhere a volcano forms out of the sea bed and presumably they die, but you never actually see what happens to them. I can only guess they were leaving open the possibility of another sequel. Miniature background split screen with real beach foreground. Note descrepancy in scales: small doll in hand too big to be the same scale as the aircraft in the next shot.